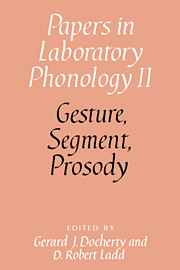 Laboratory Phonology uses speech data to research questions about the abstract categorical structures of phonology. This collection of papers broadly addresses three such questions: what structures underlie the temporal coordination of articulatory gestures? What is the proper role of segments and features in phonological description? And what structures - hierarchical or otherwise - relate morphosyntax to prosody? In order to encourage the interdisciplinary understanding required for progress in this field, each of the three groups of papers is preceded by a tutorial paper (commissioned for this volume) on theories and findings presupposed by some or all of the papers in the group. In addition, most of the papers are followed by commentaries, written by noted researchers in phonetics and phonology, which serve to bring important theoretical and methodological issues into perspective. Most of the material collected here is based on papers presented at the Second Conference on Laboratory Phonology in Edinburgh, 1989. The volume is therefore a sequel to Kingston and Beckman's Papers in Laboratory Phonology I, also published by Cambridge University Press. 3. Prosodic structure and tempo in a sonority model of articulatory dynamics Mary Beckman et al. 14. Downstep in Dutch: implications for a model Rob Van Den Berg et al. 16. Secondary stress: evidence from modern Greek Amalia Arvanti.